A childhood wish come true…. time I was twelve years old and the observatory fascinated me. I said to my mother that I wanted to work in a place like the observatory someday. And well, to my surprise Prof. Koopmann, my astronomy professor, invited me to go there during spring break and I had the amazing opportunity to do radio astronomy observing. In my first two nights of observing, I learned how to use CIMA, which is the program that allows you to control the observing mode and the setup of the receiver and also the spectrometer; I also learned how to type in the log the information of the sources like the local sidereal time, zenith angle, the scan number and the source number; and I also learned how to use IDL to reduce the data obtained from the on and off position 3 min exposures and how to look at the spectrum and tell if it had been a detection or not. In my third night observing, Prof. Koopmann taught me how to do flagging of data from the ALFALFA survey. Flagging became my favorite thing to do while I was in Arecibo. Flagging is the technique where you have to examine the spectrum recorded in different drifts and polarizations for bad data like GPS and radars and flag (mark) bad data. One also looks in the spectrum for the detection of galaxies, and records them in the information of the drift. 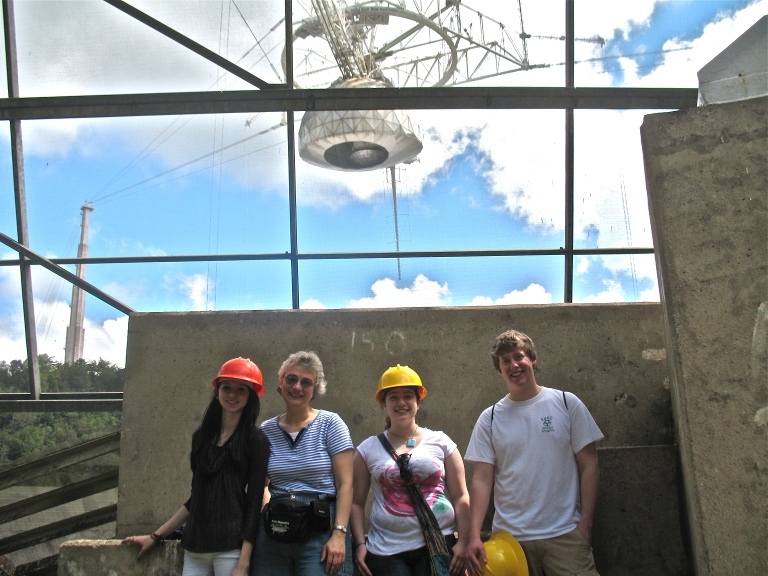 Well, overall it was a amazing and remarkable experience where besides learning a lot of techniques on how to do radio observing and going up to the Gregorian dome and seeing how it all functions, I also got the opportunity to meet and share time and experiences with a lot of wonderful people at Arecibo that inspired me in a unique way to keep learning about what I am passionate about, which is and will always be Astronomy. I will never forget such an extraordinary experience. 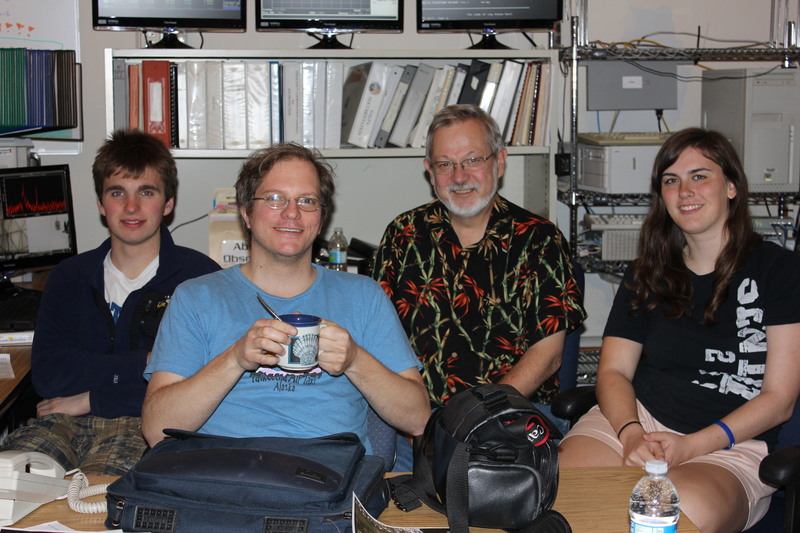 The following contribution was written by Parker Trosicht, Assistant Professor at Hartwick College, during an observing run at Arecibo Observatory. The observations are pointed observations with the L-Band Wide receiver to confirm ALFALFA detections. 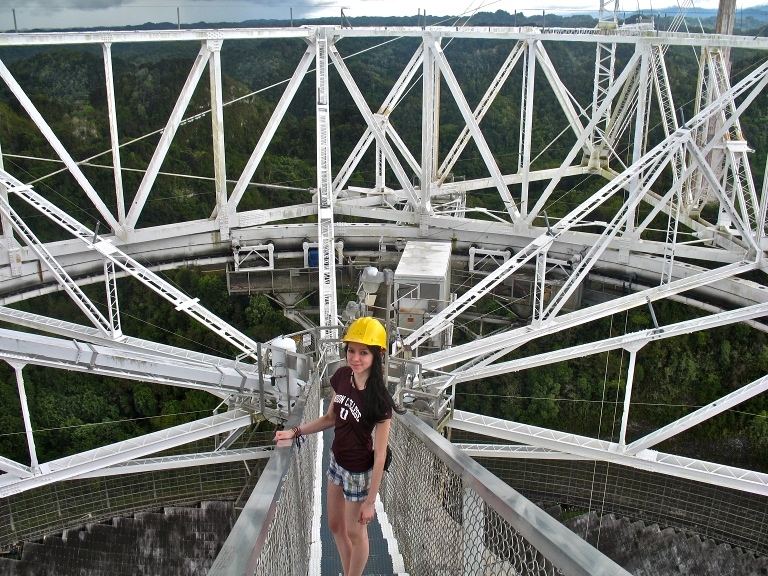 Greetings from the rain soaked Arecibo observatory! We had a couple of downpours today as we drove to a nearby town to get some food for observing tonight (the cafeteria is closed over the weekend). Luckily, our car made it through a small river that poured across the road and we made safely it back to the NAIC. On to the good stuff.. observing. This has been my first extensive experience with the L-Band Wide (LBW) observing method, building on the training received a few months ago at the UAT Workshop (thanks Martha, Betsey and Greg!). Accompanying me are two Hartwick students (Jaclyn Patterson and Kyle Murray) as well as Dr. Ron Olowin from St. Mary’s College in California. We also briefly overlapped with Dr. Rebecca Koopmann and her three students from Union College (Halle, Lucas and Rachel), which allowed us to look over the shoulder of one of the most experienced ALFALFA team members before taking the reins on Saturday (thanks Becky!). So far, the experience has been terrific!! The LBW follow up is more exciting for all of us as we are continually getting to look at recent HI detections and then quickly check with SDSS and AGC Browse to look up the probable optical counterparts and locations. We’ve seen everything from very clear double-horned spiral galaxy spectra, to strong OH Megamaser type signals, to high velocity clouds, and even some HI detections with no apparent optical counterpart at all (which could be very interesting!). The students are now comfortable with all the controls and are working on the log. Jaclyn is a junior triple major (physics/math/philosophy) who worked with me this past summer on galaxy groups/clusters research and has participated in several nights of ALFALFA remote observing from Hartwick. This is, however, her first experience with the LBW follow up. Kyle is a freshman triple major (physics/music/math) who is newer to the project, but is picking it up quickly. He participated last fall in some remote observing from Hartwick and decided to take the introductory astronomy course this spring. We just discussed radio astronomy in class a few days before traveling down here. My students see photos of Arecibo in slides and textbooks, but these certainly don’t do it justice and there is no substitute for being on site at the NAIC itself. Talk about experiential learning! Seeing the tangible progress made from the initial “blind” ALFALFA survey to the LBW follow up of several of the more interesting targets has been uplifting for myself as well as several of the more experienced students. It is also important for them to see that the large amount of effort put into ALFALFA for several years is now paying off. Personally, I can’t wait to see what other follow-up observations (including optical) tell us. As usual, it is always great to see the staff at Arecibo as well and they are always very willing to help us out. The operators have been especially helpful (Thanks Elliot, Israel and Edwin!) over the past few days. Well, a fresh pot of coffee was just brought out and it is time to see what the most recent observations look like.. so, stay tuned!! Kyle, Parker, Ron and Jaclyn. If you look closely at the monitor on the left you can see a detection!